With all the player movement that went down this offseason, NBA fans are eager for the 2018-19 season to start. Everyone wants to see what moves will matter and which ones will not. Will it still be Golden State in the end? How far will the Cavaliers fall? Who’s going to rise in the East now that LeBron James is in the West? Speaking of LeBron— will he be enough to propel the Lakers back into the playoffs for the first time since 2013? According to at least one Vegas sportsbook, the answer is yes. The Westgate Superbook started taking bets on NBA win totals Sunday. They have set the over/under on the Lakers win total next season at 48.5 games. Assuming they finish with 48 or 49 wins, they will be either the No. 4 or No. 5 seed. As could be expected, the Golden State Warriors are expected to lead the pack (62.5 wins). They’ll be followed by the Houston Rockets (54.5 wins) who will be followed by the Oklahoma City Thunder (50.5 wins). The Lakers and Utah Jazz lead the rest of the West (48.5 wins). 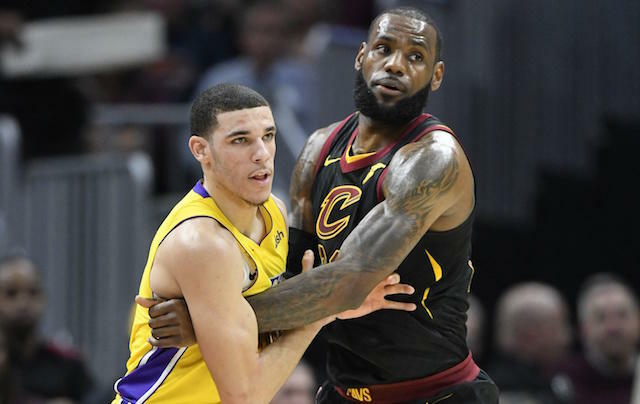 “We felt in the tougher Western Conference, we made a number [on the Lakers] that is competitive with other similar teams,” SuperBook oddsmaker Jeff Sherman told ESPN. As crazy as it may sound, there is some pretty sound logic behind the number. Last season, with the young, talented, raw group of players the Lakers had they finished the season 35-47. While they did lose Julius Randle, Isaiah Thomas, Brook Lopez, and Channing Frye, they picked up Rajon Rondo, Lance Stephenson. JaVale McGee, and Michael Beasley. And LeBron James, of course. As far as the roster goes, the only move that is really relevant is the addition of James. Let’s just say the subtractions and other additions cancel each other out. In that case, is James enough to add another 11 or 12 wins? When he joined up with the Miami Heat and Dwyane Wade in 2010, Miami won 10 more games than the year before. But they also added Chris Bosh to the mix. When he rejoined the Cavaliers four years later, Cleveland won 20 more than the previous season. The level of existing talent on both teams varied. With the Lakers, the roster is talented but raw. However, the major players should be better next season now that they’ll have a season of experience under their belts. With that in mind and with the addition of James, it is not hard to imagine them winning 48 or 49 games. Of course, this can’t account for any injuries or for just how much growing the Lakers youngsters do. Nor does it account for chemistry or off-court distractions (or infamous fathers). So, a case could be made for the Lakers not even coming close to 40 wins. There are many factors that could impact their eventual win total. Without the benefit of a crystal ball, it is hard to predict how much (or how little) each factor will matter. But if predicting win totals was easy, where would be the fun in betting on them?